This is the most popular method for growth, because it’s the easiest to understand. Everybody wants more customers, more clients, more subscribers or more donors. Generating more customers is important, and it works, but unfortunately it’s also generally the most resource intensive way to grow. 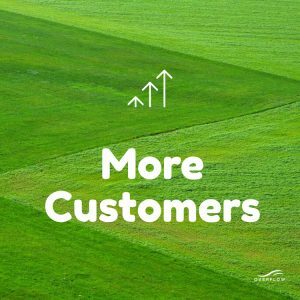 The best way to get more customers is to create as many systems of evergreen growth as possible. What marketing methods do you have that work every time? As you develop more of them put them on a schedule so that they are running as much as they profitably can. Make sure that you’re always measuring the results. Here at Overflow: One of the services we provide most frequently to our clients is lead generation. We source and convert the leads and drop them at your doorstep. Clients pay us a management fee + advertising costs, or we handle the ad costs and charge the client per lead. Pay Per Lead is generally a bit more costly for each new customer, but we take on all the risk. Have you ever found out that some of your best clients are buying things from competitors (that they should already know) you offer? They pigeonholed you into the one category they know you for, but would have loved to buy both items from you if they’d known they could have. In method 2, the goal is to get your current clients to do business with you more frequently. Increase the volume and quality of your communication with them to let them know how buying more often will be fruitful for them. Also, educate them about all of your product offerings. 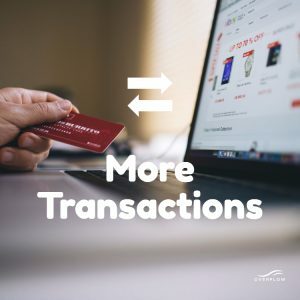 If you can get the customers you already have to make twice as many transactions (with the same average value per transaction), you’ll end up with the same growth as if you’d doubled your customer base. However, it’s more efficient to transact more business with your current clients because you don’t have to convince them to trust you. They already know who to contact and how to buy. Plus, contacting them is less costly than new customers because you know exactly how and where to find them. Here at Overflow: We’re strong believers in multiple touch follow-up campaigns. We use email, retargeting ads, text messaging and even direct mail to automate the process of communicating with your core customer base. These tools give us the platform to figure out what your current customers want and educate them on how more frequent transactions are good for their needs. Fast food restaurants are masters in the art of upsells, cross-sells and increasing the total amount of revenue per transaction. You didn’t need that extra 40 ounces of soda, or the 2 cookies, but hey it was just a few cents more. Right? 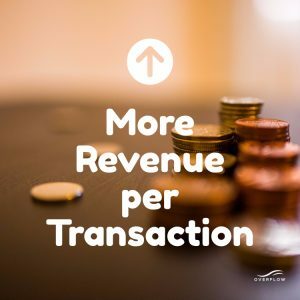 Increasing revenue per transaction isn’t only about small upsells. Direct Marketers have learned that you can sell a $7 product, and immediately upsell to something that’s $997. Once someone buys something from you the nature of the relationship changes dramatically. Once they decide you’re trustworthy enough to buy from, the relationship goes from “salesperson & sucker” to… haha just joking! The relationship goes from “salesperson & target”, to “service provider and client”. The big takeaway here is that the client relationship isn’t tied to the amount of money the person spent with you, only to the fact that they decided to buy. I joked around about the potential customer being a “sucker”. That’s never true if you’re a decent human being that realizes the lifetime value of a client, but shoppers often feel like that’s what a salesperson thinks. However, once you’re their service provider, the default feeling is that they trust you to deliver results and have their best interest in mind. Increasing your revenue per transaction is about building a stronger relationship with your client where you understand what additional elements will make their lives easier, happier and more fulfilled. When you’re doing a good job of understanding what they want more of, they will happily pay you to give it to them. Here at Overflow: We specialize in building out sales funnels. Whether it’s constructing the sales scripts that your sales people use, or building a digital funnels that automatically offer the right options to the right prospects, we’ve got you covered. Together we can increase your revenue per transaction by doing a better job of presenting the available options, testing upsells and even ethically spying on your competition to make their wins yours. Here’s a Pro Tip for you. 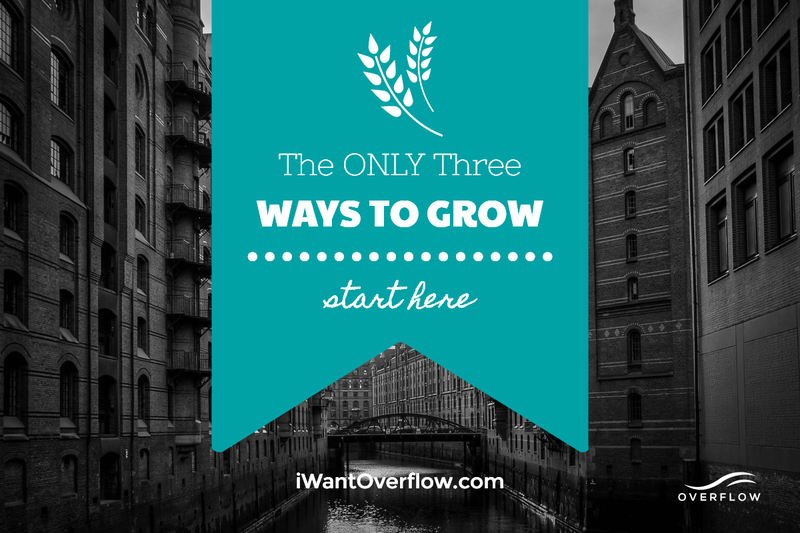 Focusing on any one of these 3 methods will lead to growth. When you integrate more than one at the same time, you generate exponential growth. If you’re looking for some immediate changes you can make to see an increase of sales and revenue overnight, I’ve put together a checklist of the methods I use most frequently when consulting clients. I print a copy whenever I’m consulting a client who wants immediate growth. Grab the PDF by filling out the form below. Let’s learn from each other. How have you linked multiple models together successfully to generate explosive growth?